The Mediterranean is much more than a destination for MSC Cruises, it’s their home. Family owned and operated, MSC Cruises is part of Mediterranean Shipping Company, the world largest privately owned shipping line. While the Mediterranean is known as their traditional home, they also offer outstanding itineraries in the Caribbean, Scandinavia, South America, South Africa and itinerary focused Trans-Atlantic crossings. Onboard, their world-renowned hospitality is complimented with authentic Italian and international cuisine. For Cruises in the Mediterranean and Northern Europe the onboard currency is the EURO. 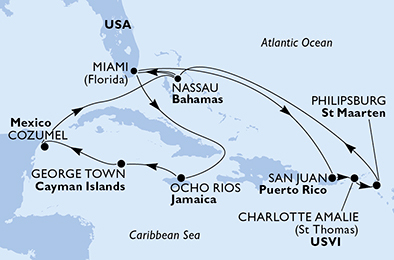 For cruises in the Caribbean, America’s, South America and South Africa the onboard currency is US Dollars. 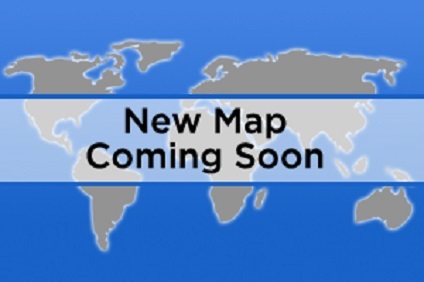 For Ocean Voyages it is dependent on departure point of the itinerary. 24 Night Cruise sailing from Durban to Venice aboard MSC Musica. 7 Night Cruise sailing from Barcelona roundtrip aboard MSC Bellissima. 7 Night Cruise sailing from Marseille roundtrip aboard MSC Divina. 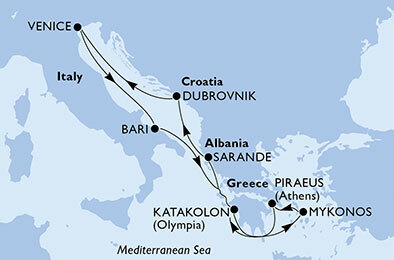 7 Night Cruise sailing from Livorno roundtrip aboard MSC Fantasia. 7 Night cruise sailing roundtrip from Marseille onboard MSC Divina. 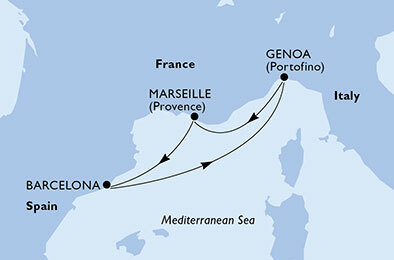 3 Night Mediterranean Cruise departing roundtrip from Genoa onboard MSC Sinfonia. 7 Night Cruise sailing from Marseilles roundtrip aboard MSC Bellissima. 7 Night Cruise sailing from Genoa roundtrip aboard MSC Divina. 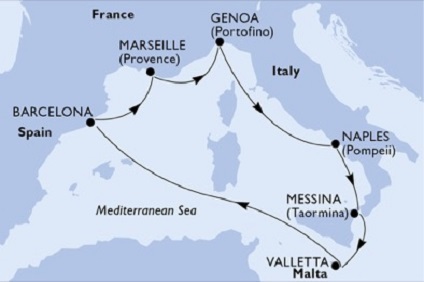 7 Night Cruise sailing from Genoa roundtrip aboard MSC Fantasia. 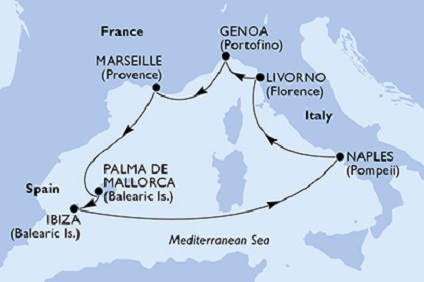 7 Night Cruise sailing from Venice roundtrip aboard MSC Lirica. 7 Night Cruise sailing from Kiel roundtrip aboard MSC Meraviglia. 14 Night Cruise sailing from Kiel roundtrip aboard MSC Meraviglia. 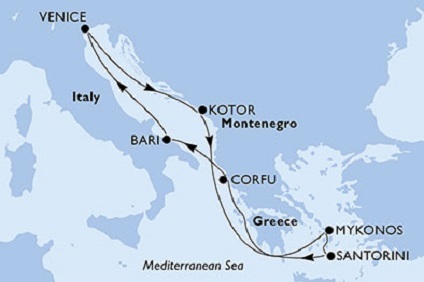 7 Night Cruise sailing roundtrip from Bari onboard MSC Opera. 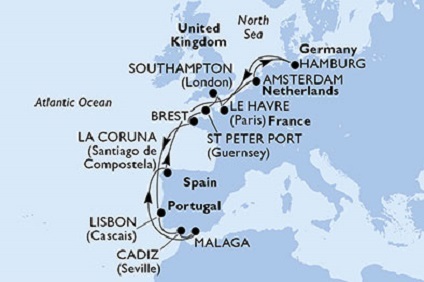 7 Night Cruise sailing from Barcelona roundtrip aboard MSC Seaview. 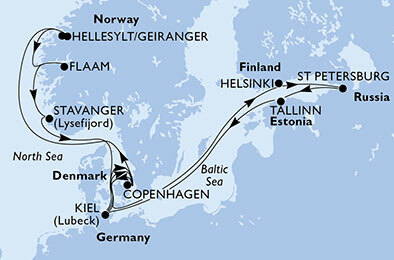 15 Night Cruise sailing roundtrip from Hamburg onboard MSC Preziosa. 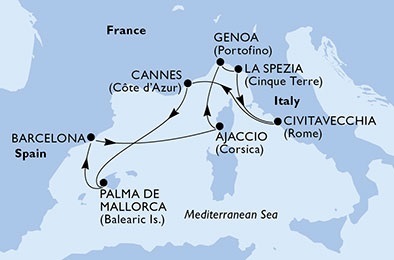 5 Night Cruise sailing from Venice to Genoa onboard MSC Orchestra. 7 Night Cruise sailing from Genoa roundtrip aboard MSC Bellissima. 7 Night Cruise sailing from Rome roundtrip aboard MSC Divina. Imagine crêpes Florentine, pumpkin risotto with truffle oil and lobster with coriander and anise. In each ship’s main restaurant, dining is a special occasion with our renowned seven-course menu, including a different regional Italian specialty each night. We call our medley of fresh Mediterranean flavors, La Cucina Italiana. You’ll take pleasure in the fresh taste of gourmet Italian food served in an elegant European atmosphere. Each ship offers a varied selection of fine dining and casual venues ranging from the only Chinese restaurant at sea, to a sushi bar, a lively Tex Mex restaurant, and of course, an authentic pizzeria. You can also savor a taste of heavenly delights at our midnight buffet. Then sleep in and enjoy a private breakfast on your balcony. Buon appetito! During your cruise, you will meet staff throughout the ship who provide you with excellent service. They are supported by just as many staff and crew who work hard behind the scenes to ensure you enjoy every moment on board. For your convenience MSC Cruises will automatically add a daily Hotel Service Charge to your shipboard account, based on your chosen itinerary and the number of days for which the services are actually provided. The Hotel Service charge serves to ensure we maintain the highest quality standards of service to our guests. The daily amounts below have been calculated with this in mind and cannot be modified. However, should you wish to remove any of the daily Hotel Service Charge in the unlikely event that you do not receive satisfactory service, you may do so by contacting the Guest Relations Manager on board. MSC Cruises does not recommend tipping individual members of staff. MSC Cruises is a family owned and operated cruise line and this is reflected strongly in the offers and inclusions that they provide for families onboard their vessels. CHILDREN TRAVEL FREE ALL YEAR! With an MSC Cruise children up to the age of 18 years can cruise free when sharing a cabin with two paying adults, however they still pay port charges. 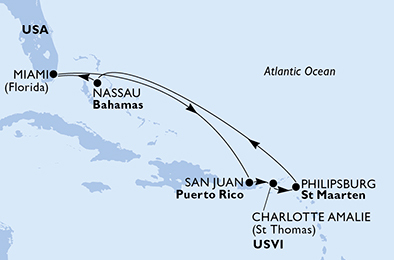 This offer is valid year round and on the majority of cruise itineraries. MSC Cruises can also provide child airfares, transfers and excellent shore excursion rates to make a family cruise enjoyable and affordable. In all of the restaurants on the vessels a combination of children and regular menus are available so that all the children of all ages to find a tasty and enjoyable meal. Many of the ships allow the family to dine in a relaxed manner offering coffee houses and pizzaries as well as dining rooms. All of MSC Cruises vessels offer free admission into the Mini Club for children between the ages of 3 and 9, these mini clubs offer selected programs and entertainment to allow the children to enjoy the vessel and for the parents it is open during shore visits to allow the whole family to enjoy the time in port. The Junior Club offers children between the ages of 9 and 13 a chance to meet, explore and enjoy together while the Teenage Club up to the age of 18 allows the older children to experience the cruise with similar aged friends. The introduction of the TEEN CARD open’s the door for teenagers to enjoy both freedom and fun in the best way possible. Families can pre purchase cards at a set amount at time of check-in that allows the children both access to the cabin and various cruise beverages without breaking the bank. On many of the ships in addition to all the above for families, special pools are set aside to be children only or have times of the day dedicated for the children so everyone can enjoy the facilities the best they can.